Guidobaldo del Monte (1545-1647), a patron and friend of Galileo Galilei, believed he had witnessed the creation of something out of nothing when he established mathematically that zero equals one. He thereby thought that he had proved the existence of God! Although I daren't be so bold with my claims, I am willing to prove instead that one equals two. And, moreover, just to convince you that I am right I will do so multiple times over, drawing upon a wide spectrum of mathematical techniques: algebra and arithmetic, probability and mechanics, pure thought and physical action! Will you be able to find fault with any of my "proofs?" 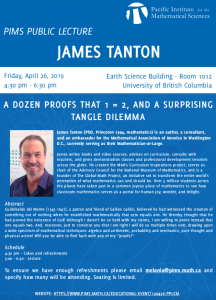 James Tanton (PhD, Princeton 1994, mathematics) is an author, a consultant, and an ambassador for the Mathematical Association of America in Washington D.C., currently serving as their Mathematician-at-Large. He has taught mathematics both at university and high-school institutions. 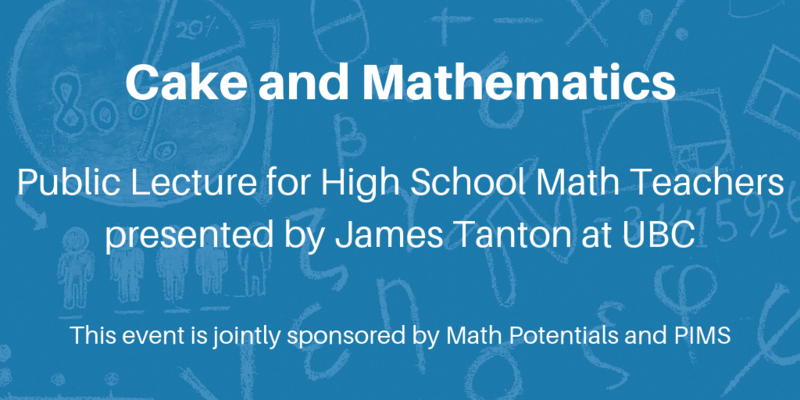 James is absolutely committed to promoting effective and joyful mathematics thinking, learning, and doing at all levels of the education spectrum. James writes books and video courses, advises on curriculum, consults with teachers, and gives demonstration classes and professional development sessions across the globe. He is a founder of The Global Math Project, an initiative set to transform the entire world’s perception of what mathematics can and should be. Over 5 million students across the planet have taken part in a common joyous piece of mathematics to see how classroom mathematics serves as a portal for human joy, wonder, and delight. This event is jointly sponsored by PIMS & Math Potentials.